In 1948, as one of several events to mark the six-hundredth anniversary of the foundation of the Most Honourable Order of the Garter and of its spiritual arm, the College of St George, a service of installation was held at St George’s Chapel, Windsor Castle, on St George’s Day, 23 April. It was at this service that Princess Elizabeth and her husband, Prince Philip, Duke of Edinburgh, were installed as Lady and Knight Companion of the Order of the Garter, along with thirteen other new Garter Knights. 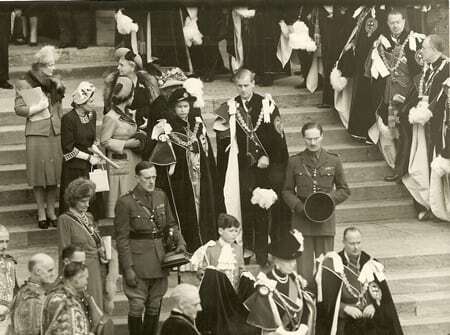 The Royal couple are shown here on the West Steps of St George’s after the service. So commenced the formal association of Her Majesty the Queen with the chivalric order founded by her distant ancestor Edward III; an association that has lasted over sixty years. The Garter ceremonies, revived and augmented by King George VI for the sexcentenary, were a resounding success and the celebration of Garter Day has continued in this pattern ever since. Garter services have not been held every year since 1948 – they were not arranged in 1949, 1952 and 1953, and the 1955 ceremony had to be cancelled owing to a rail strike – and no longer take place on St George’s Day. However, the annual procession and service in St George’s Chapel, now generally held in June, continue to draw the crowds, as in 1948, to share in the religious ceremony and pageantry of this historic royal occasion: a truly British institution with the monarchy at its heart.